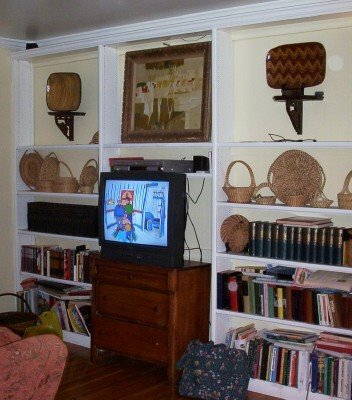 Today I plan to restyle the built-in bookcases in our family room. It's another no-cost project for resale. As you can see, we love to collect books--but not to reshelve them. The wires from the home theater repair were never poked back into submission. The basket collection has grown beyond its two shelves. I want to remove the military history books to the study, weed out the fiction, and condense reference to the bottom four shelves. The baskets can be displayed on two shelves for a cleaner look. I will finally hang that yard sale picture light over the painting. Overall, less functional for daily living--but more favorable for resale. Oh, I love those shelves! I think you're going to make them look even nicer with your restyling. The big thing is to reduce the clutter, and that sounds like just what you plan to do! What about a few old family photos for a 'homey' look? No-cost decorating...thats my way of thinking! I do this often, its amazing just placing things differently and ridding the clutter, makes a huge difference! do we get an after photo? I know with your talent it will look perfect! Frankly, I like the dresser being used as a Tv Shelf. Much more useful. The gap is not noticeable except at the extreme angle from which I took the photo, luckily.